This large, hardback volume is a wonderful investment in your language arts curriculum and in your general reading library. With 572 poems, this single book could last you three years if you read one poem each day. In fact, that is the approach we’ve taken with this book, savoring one poem each day in a Charlotte Mason style. We’ve ended up using this volume for third, fourth, and fifth grade poetry study. And we’re still not tired of it; my daughter consistently looks forward to poetry time. You can see the topics are wonderfully appealing to children – foods, children, animals, unique personalities, and nature. One of my main considerations in choosing a volume of poetry was that it be engaging. I wanted my daughter’s earliest introduction to poetry to be positive so that she would always have an appreciation for verse instead of a fear of it. 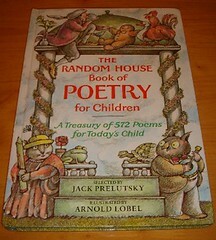 Other poetry collections I looked at seemed dry and too mature for young children, but The Random House Book of Poetry for Children is suitable for the earliest of students. You could use this from Kindergarten up to fifth grade. Most of the poems are short and nonthreatening even to poetry haters. This is how we use The Random House Book of Poetry for Children. Although we occasionally vary our pattern, usually I read the poem outloud and my daughter narrates it back orally. Once a week she copies a poem onto a notebooking page. 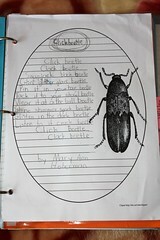 It’s a very simple and enjoyable way to incorporate poetry into your homeschool. We also used The Random House Book of Poetry for Children as the basis for a more in-depth poetry study which is available at Homeschool Share. It includes many figures of speech such as personification, imagery, and onomatopoeia. Next year when my daughter moves to sixth grade, I will switch to a slightly more mature poetry collection. But I feel sure that The Random House Book of Poetry for Children will continue to be a well-loved volume on our shelf.